Cleaning your jewelry is important, not only because it makes your jewelry stand out, but also because it rids it of all the dirt and grime that can accumulate on a daily basis. Most people spend a lot of time cleaning their homes and items throughout their home, but it’s easy to forget small pieces of jewelry that are a daily part of our wardrobes. Rings, for example, get dirty very easily because they come in contact with so many different places and products like soap, lotion, food, etc. Keeping your fine jewelry clean is necessary in order to ensure it lasts a lifetime like it was created to, and that you always look your best. Taking good care of your jewelry is a simple task, and Shine Jewelry Cleaner makes that task even easier. 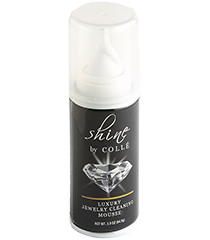 Shine Jewelry Cleaner is a non-toxic cleaning mousse that is convenient, safe, and environmentally sustainable. It is designed to quickly and safely clean all types of jewelry. Our Jewelry Cleaning Mousse is very easy to use. You simply fill up the outer lid of the container with the mousse and place your jewelry into the mousse. For larger pieces of jewelry, you can use an alternative container. As Shine Jewelry Cleaner works its magic cleaning your jewelry, the mousse will slowly dissipate and break down within about 5 minutes. Once the mousse has dissipated, you simply rinse your jewelry with warm water and pat dry. Shine Jewelry Cleaner is the best jewelry cleaning alternative that is essential for every jewelry lover.